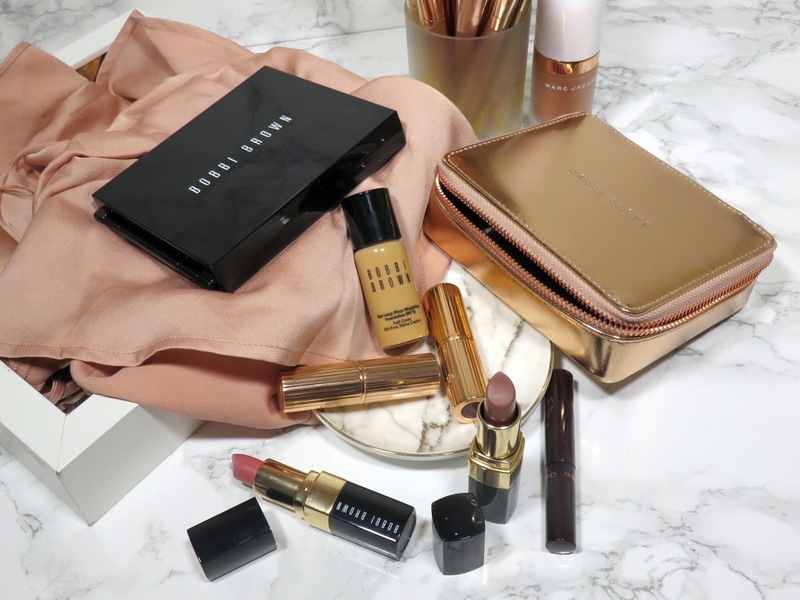 I don't usually gravitate toward the Bobbi Brown range. I think it's because it it's quite basic most of the time and kind of boring but every time I get something from the line, I'm always impressed. 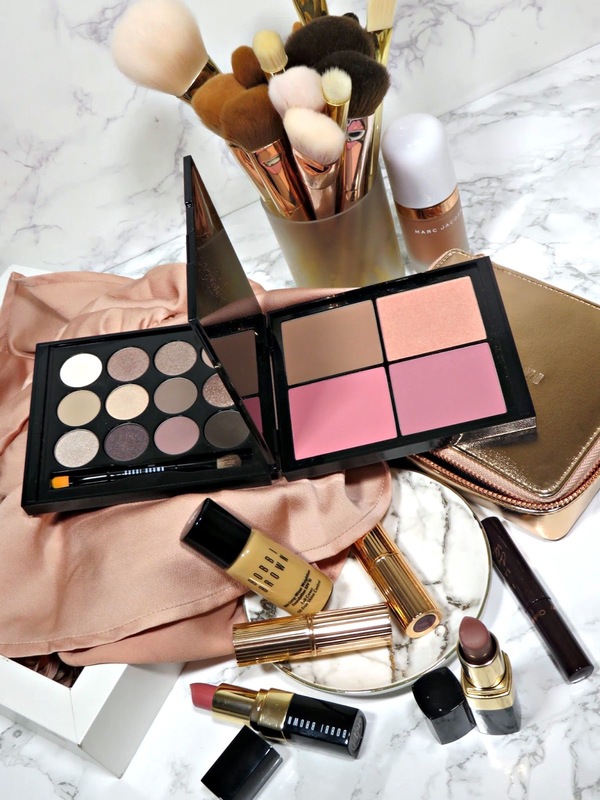 The quality is always excellent and the products are usually so wearable! I spied this cute kit during the Nordstrom Anniversary Sale and I was torn whether or not I needed it. It seemed like a great value and my kind of colors so I went for it. 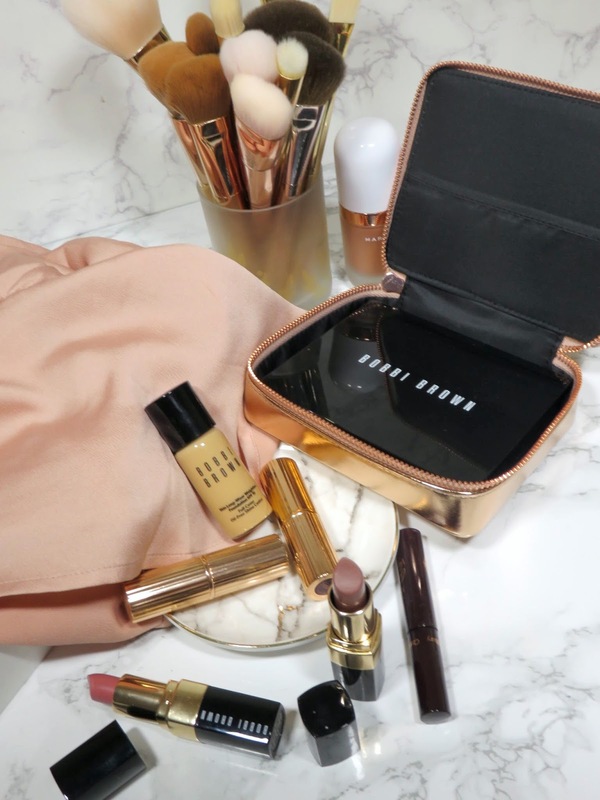 The Bobbi Brown Deluxe Eye & Cheek Set retails for $98.00 USD and is available exclusively at Nordstrom for their Anniversary Sale. This set is supposedly a $380 value, which seems like a bit of a stretch. However the palette does come with 12 eyeshadows and 4 blushes. 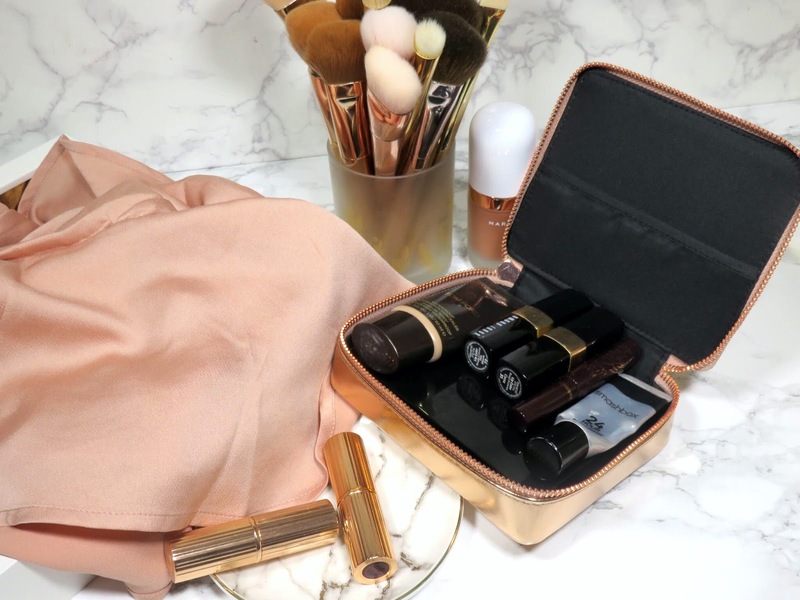 It also comes with a stunning metallic rose gold carrying case, which was what immediately caught my eye. My weakness for rose gold knows no bounds. Let's quickly talk about the travel case, it is a beautiful faux leather metallic rose gold rounded-rectangular case with a zipper. 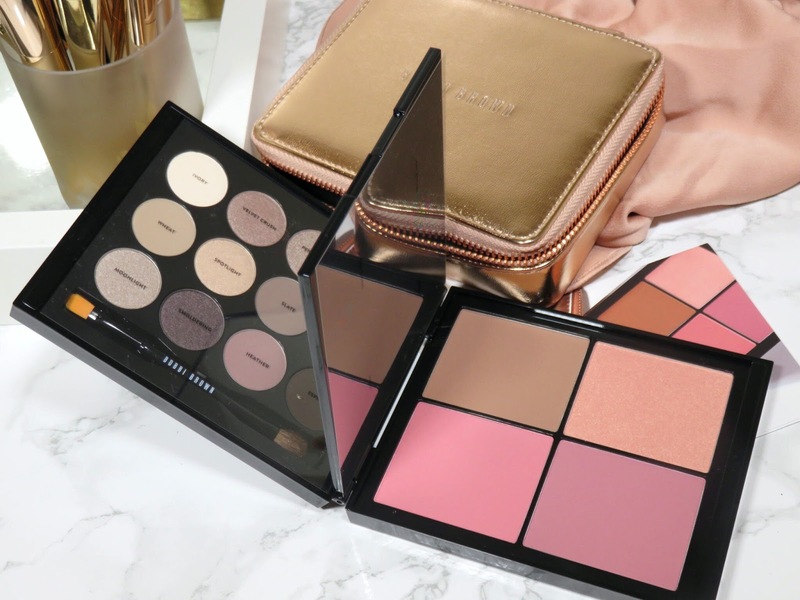 The palette fits perfectly inside with a little extra room on top to contain any other products you may need. I threw in my Tom Ford Waterproof Foundation/Concealer because it's in a small travel-friendly tube, two Bobbi Brown Lipsticks, and a mini mascara. It was not long enough to contain by brow pencil, it could go in diagonally but it wouldn't fit with all the other items. There is a cute little pocket on top, where you can store some additional items. Overall it's a great compact size that is easy to travel with. This set is a beautiful travel-friendly kit with with such a broad variety that you really can create just about any look and take it from day to night. The shadows range in a variety of textures and colors but they all seem to have a neutral smokey purple tone. 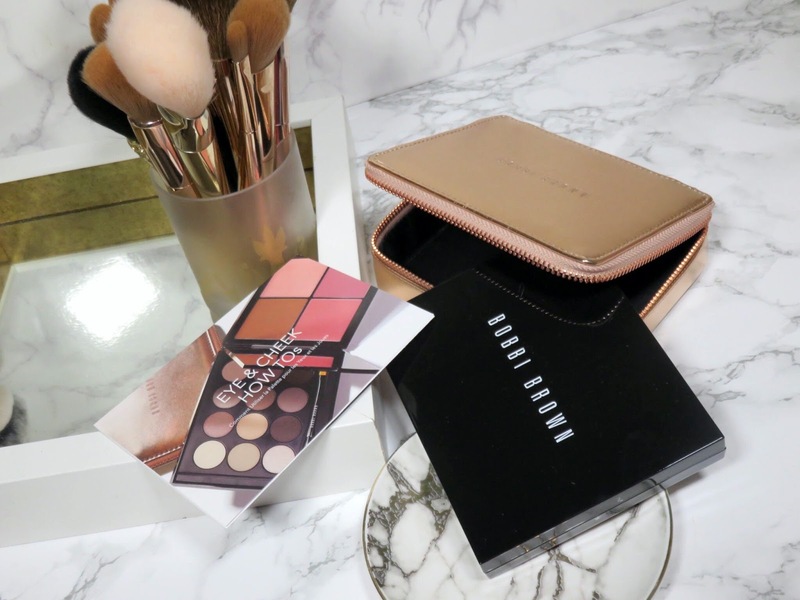 I have never tried Bobbi Brown shadows before but I have high hopes for them since I have tried a handful of their other product and I have really enjoyed them. 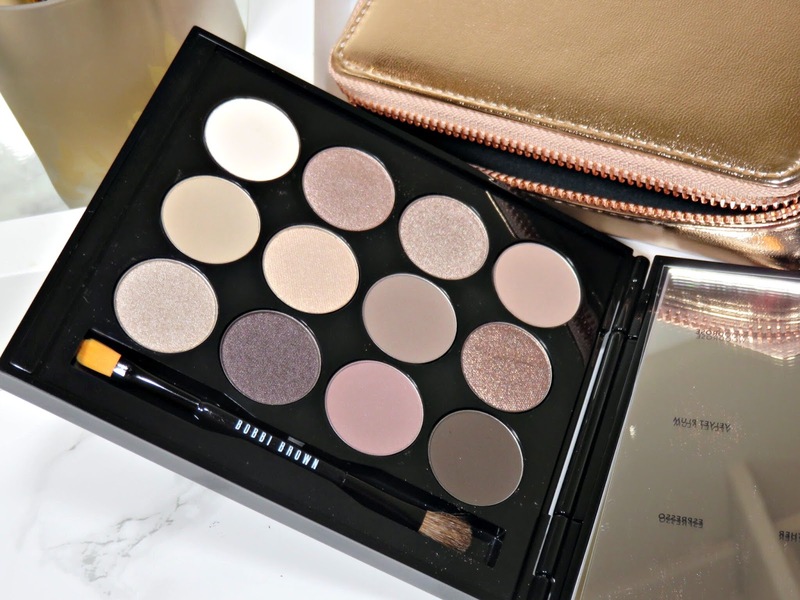 The palette's packaging is a very simple clack plastic case but it feels quite heavy and luxurious. It is magnetized and opens up like a book. When you flip the cover open you will see the 12 eyeshadows and a mirror. The mirror is really large and so great for doing your whole face makeup with. When you flip the mirror over, there are all the face products. The palette comes with plastic slips with the names of the colors on them but you can actually throw these away because the back label contains a map of all the colors! I have to say, the quality of all the eyeshadows is excellent! They are all extremely creamy and pigmented. They all blend beautifully and build up color very well. The shadows are quite soft, so I recommend tapping your brush off and only picking up a little at a time to prevent fallout. While the shadows are soft in texture, they aren't powdery. They adhere very well to the eyes and blend very easily into each other. The color scheme obviously tilts toward the cooler and more purple-toned side but I can see this working for many skin tones. 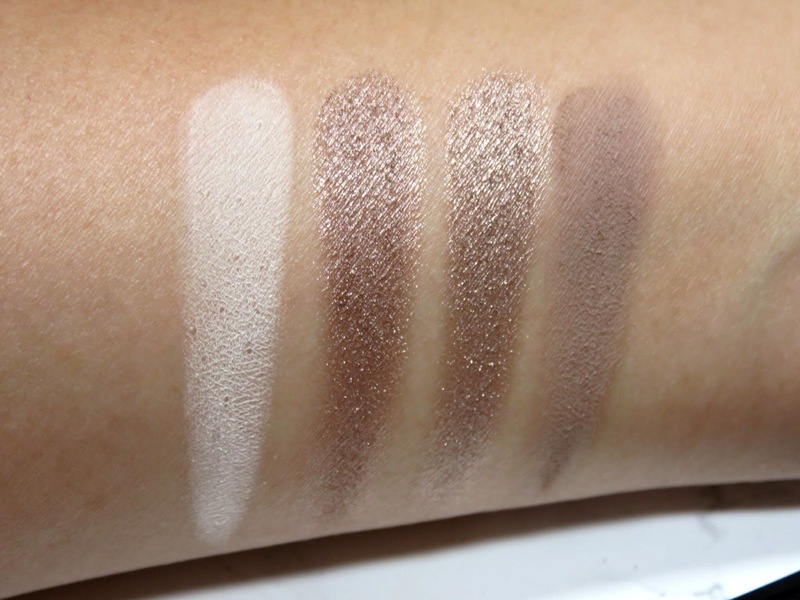 Like I said, the shades are all very pigmented and buildable, so they can work even on deeper skin tones. I love the nice balance and variety of textures, with many mattes, metallics, and shimmer shades. 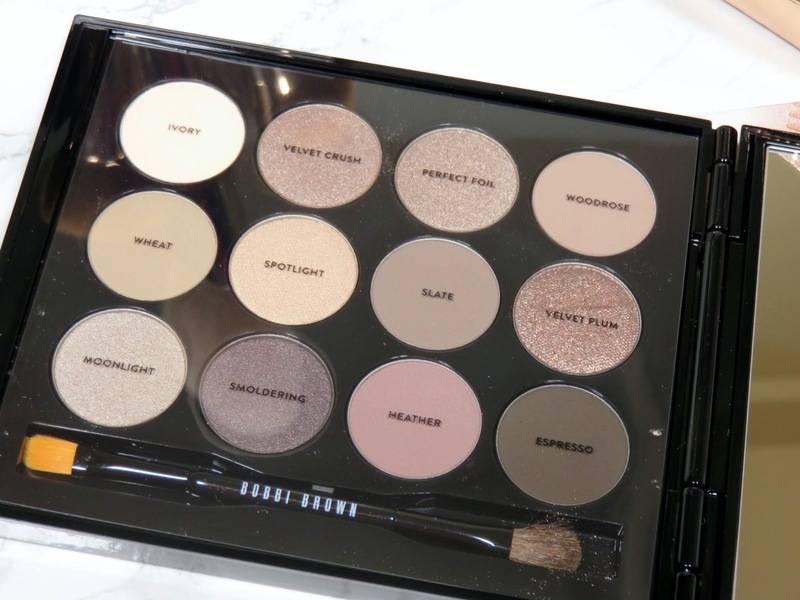 It feels like a very balanced palette when you use it and all the shades seem really cohesive. Even the one very obviously warm shade, Spotlight (a warm gold champagne), works well with the other shades. 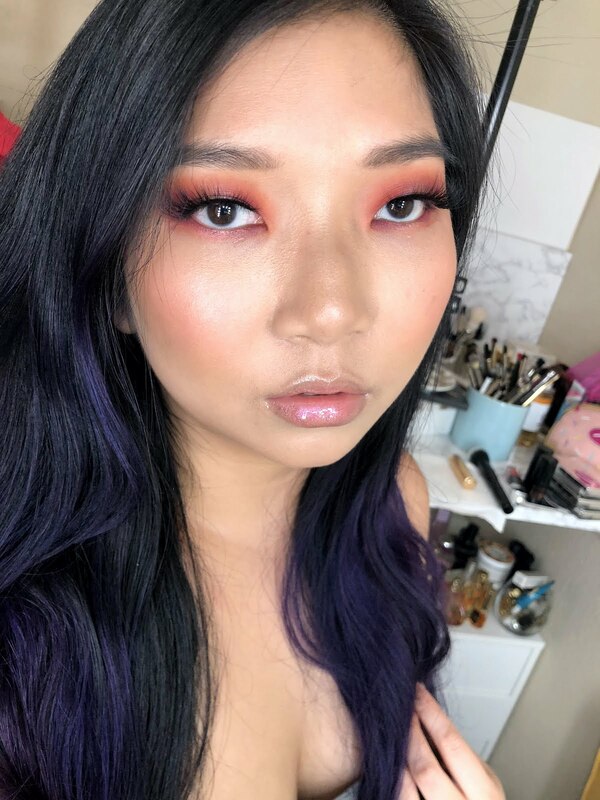 I was kind of thrown off at first because this one warm shade felt so out of place but as I began incorporating into my looks, it just worked! I was most worried about Velvet Crush (the shimmer wash, glitter shade) because I thought it would produce a lot of fallout and be quite gritty but I was pleasantly surprised to find that though it does have larger particle of shimmer, it still has a creamy texture and adheres to the eyes very well! It's a beautiful glitter shade, especially for the evening! 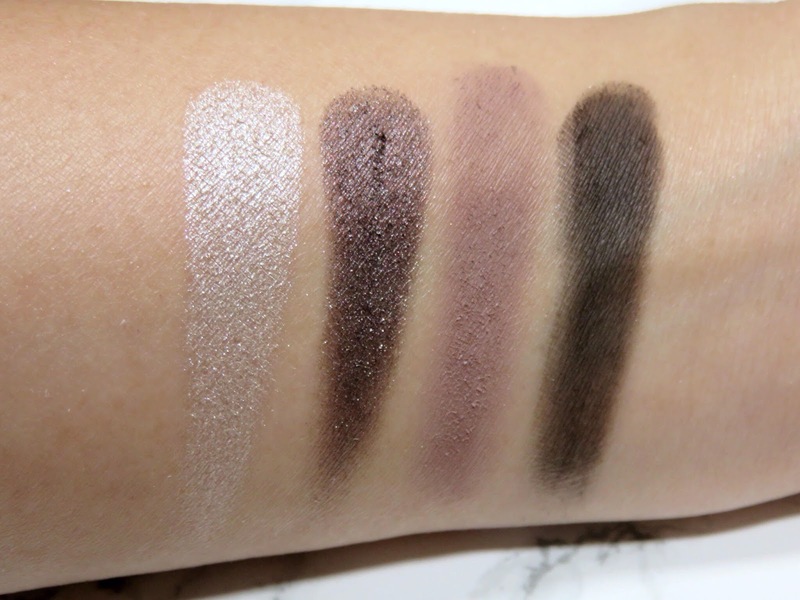 I can see why this palette is intended to be a day to night palette, it really has a great range of softer an lighter shades to deeper and smokier shades. It really allows you to create a complex look! 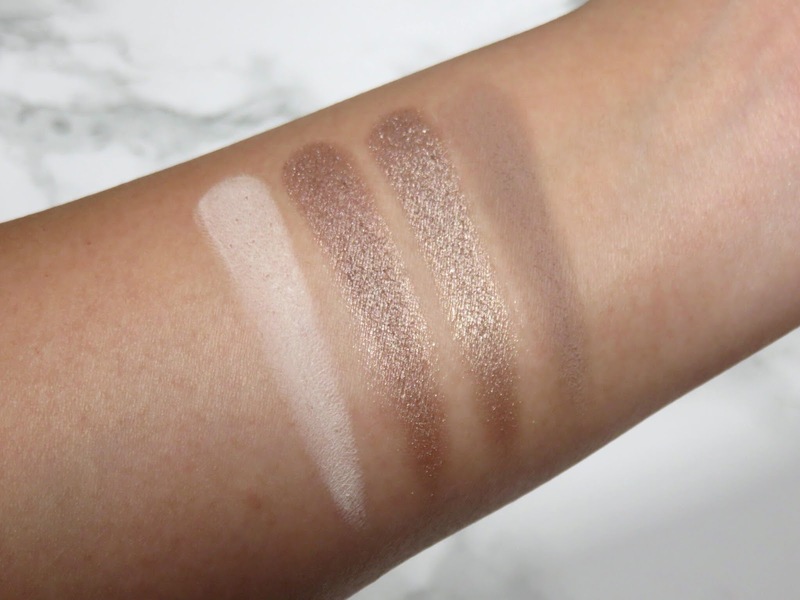 Medium Bronzer (matte) - This medium bronzer is so universal! Back when I worked as a makeup artist, this was an essential in my kit that I used on pretty much everyone! The color is so universally flattering, not too warm and not too cool. 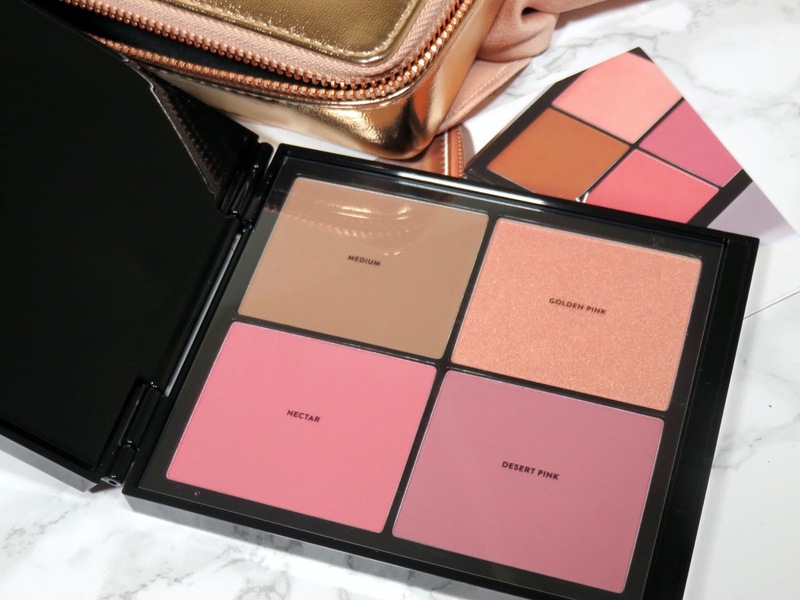 It is perfect for sculpting the face because of its matte finish but can also add the perfect bronze glow to the skin! I'm very happy to see it in this palette and it will probably be the first product I hit pan on! Golden Pink Shimmering Bronzer (shimmer) - This shade looks like it can be a blush but when you apply it, it is a shimmering gold with a pink undertone. 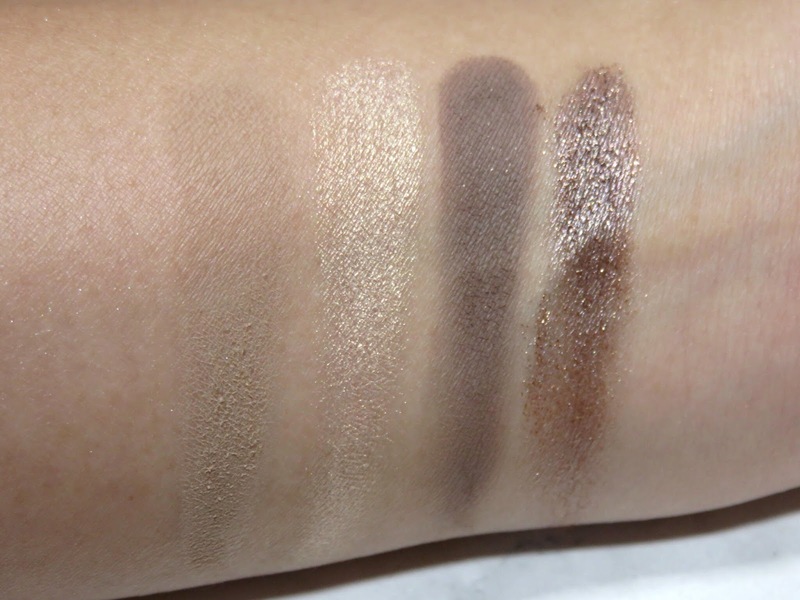 In swatches, it looks like a duochrome shade and the texture is very soft and finely milled. 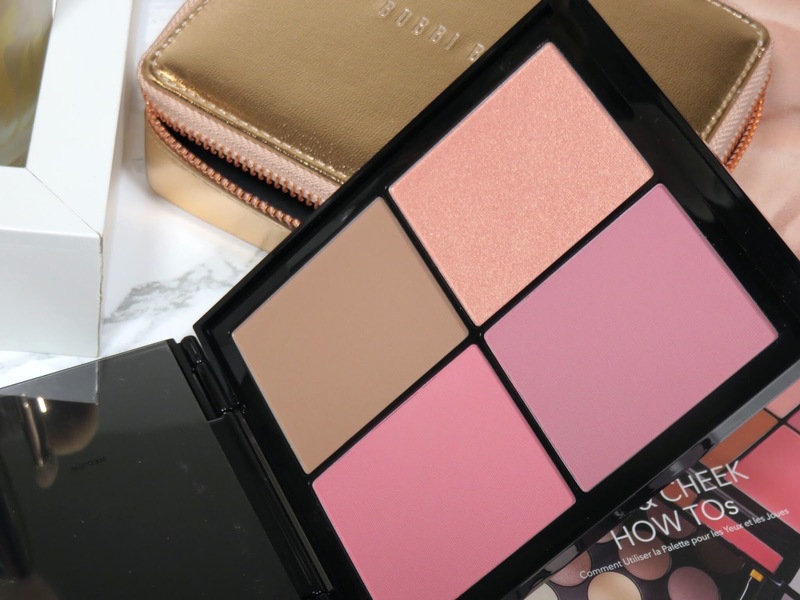 Don't be afraid to pack this on, it gives a beautiful glow without chunky bits of shimmer. You can also use it as a blush topper or mixed with the blushes for a shimmering blush. Nectar Blush (matte) - This blush is a soft medium pink with a pinch of warmth. I can see why they included this shade here. It is a universally flattering pink that doesn't lean too warm and will still compliment the eyeshadows. It is very pigmented and it blends very nicely into the skin. 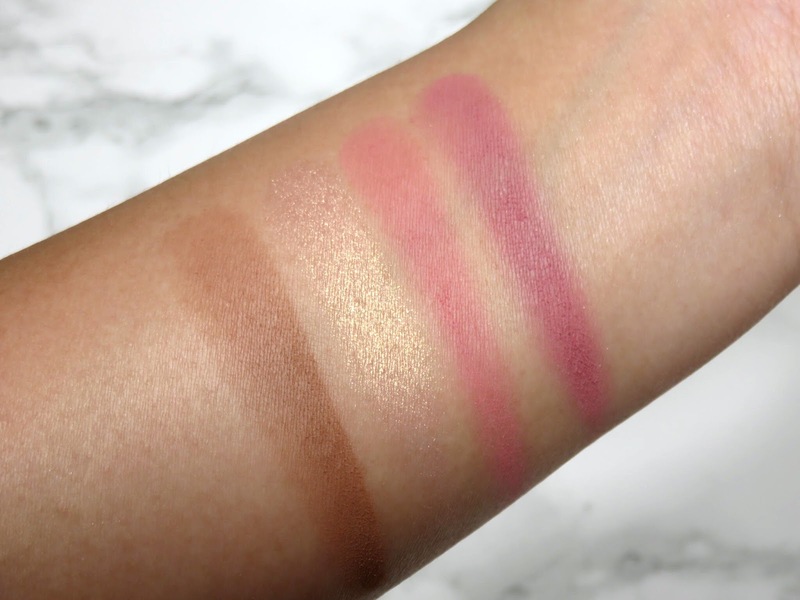 Desert Pink Blush (matte) - Again, this is a very universally flattering blush shade. This mauve runs a little cool and purple-toned but not too much so that it wouldn't compliment a warm skin tone. 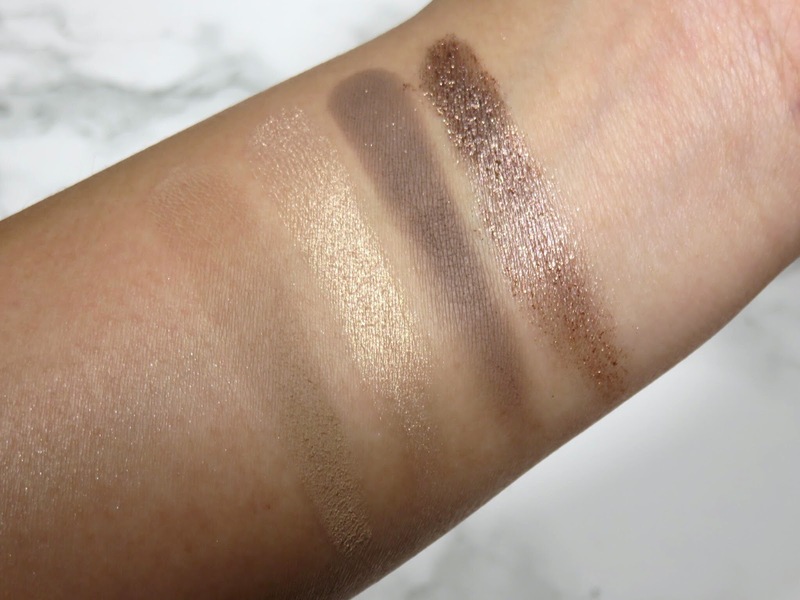 This shade works incredibly well with all the eyeshadows, since they lean on the cooler side and purple side. 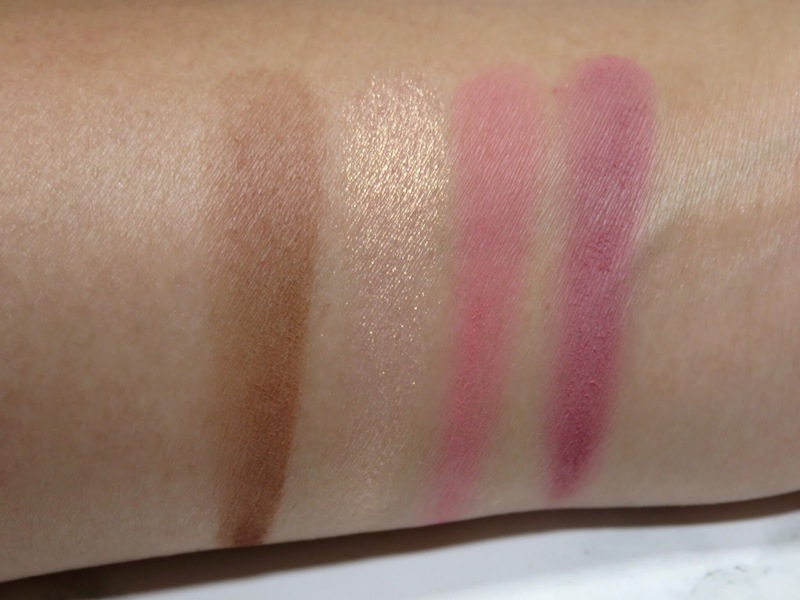 This shade is also very pigmented and blends well into the skin. I think this set is an amazing value for the price! 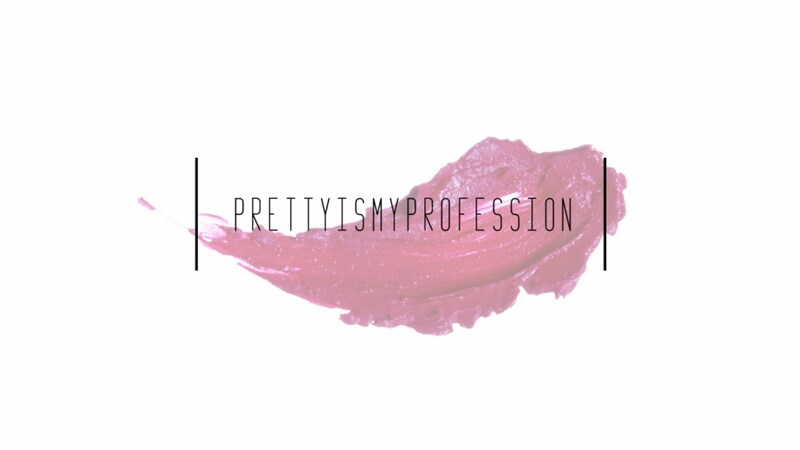 You get so much product and the quality is really exceptional! This palette was kind of an impulse buy for me and I really didn't know if I wanted to keep it but after using it, I was so happy I grabbed one! 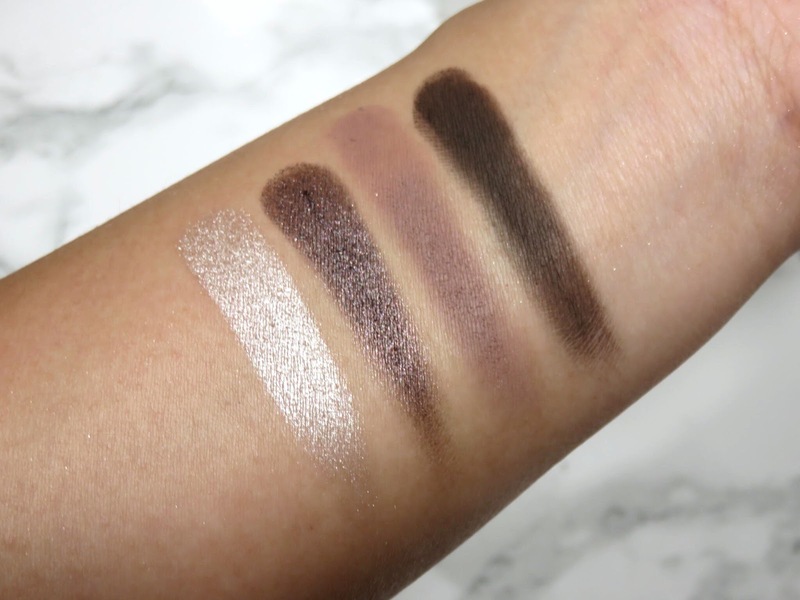 The textures of the eyeshadows are really beautiful. These are easily some of the best I have ever used! They feel very creamy and blendable but they also pack a ton of pigment! The cheek products are beautiful complimenting addition to this travel set. Everything about this set feels very luxurious but it is also the perfect travel friendly size! I plan on taking this with me on my next trip, it really has pretty much everything I need and the beautiful rose gold case will hold anything else I need. If you were on the fence about this set, like I was, pick it up! It really is lovely and so easy to use everyday!